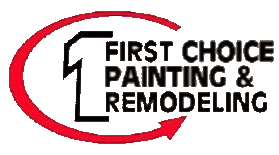 Established in 1995, First Choice Painting & Remodeling has proudly become an exceptional painter in Houston, Texas and surrounding towns since 1997. When you're looking for a house painter in Houston for superior interior or exterior painting, we are dedicated to each and every one of our Houston painting projects. We have employed the areas best painters so that we can provide our customers with the best services. Our commitment to the customer is to provide a first class finished project, and we won't be happy until our customer is completely satisfied. With several Houston area painting companies to choose from, we understand it’s hard to pick the right one. Here at First Choice Painting & Remodeling, it is our goal to preserve and protect the beauty of your surroundings at a fair price. Striving to exceed your expectations for 22 years, our dependable, trustworthy and passionate Houston painters are committed to providing you with a long lasting impression. Here at First Choice Painting & Remodeling, our mission is to enhance the essence of your home or business. From waterproofing to pressure washing in Houston, we will make sure your space is prepped and ready for an even coat of paint, and our friendly and professional painters will work with you to ensure everything on your wish list is met in a timely manner. First Choice Painting & Remodeling employees Houston area's best painters! First Choice Painting & Remodeling uses only premium quality paints and materials to ensure long lasting finishes. With our extensive prep work, innovative application systems, outstanding painters, and top quality products, we're sure to give you an unforgettable painting experience. Looking for a handyman? Our craftsmen at First Choice Painting & Remodeling are not only painters, but also expert handymen. So when you're looking for an expert handyman to handle those repairs and home improvements, call First Choice Painting & Remodeling. Remodeling your home involves a lot of decision making, the first being, where to start. Well, you can start by calling First Choice Painting & Remodeling at (832) 271-4712 for all your remodeling needs in the Houston Texas area. When it's time to update your home with fresh, modern touches, First Choice Painting & Remodeling has the expertise and professionalism to work with you every step of the way. Whether you’re looking for a painter, handyman, or remodeler, be sure to call First Choice Painting & Remodeling to find out exactly what we can do for you. Affordable, Professional, High Quality Painting in & around Houston.